So here is a list Adoptive Families Magazine put out a few years ago. It's simple...and has most of the offensive phrases. You love us? Ok..maybe, but I KNOW you love Miles. :) Read it. Pass it along. I've been told that I offend people by posting things like this, and that I should be "more forgiving" to those who use hurtful language. But you're right, we need to teach others so that they don't hurt our children. And that's the most important thing. As a 26 year old adoptee, I can think of several times in my life when insensitive comments by my peers stung a little. Nowadays, however, I'll sometimes intentionally use the inappropriate words to describe my own adoption; it adds a kind of shock-value comedic effect, particularly when I joke about my "born to unmarried parents" origins. We recently adopted 5 children from Ethiopia and it was been painful at times to hear the comments people make about adoption. Can I repost this chart on my blog? A little education on such matters can go a long way. @Haws House - yes, you can definitely repost the chart. I have one question and hope it doesn't come across disrespectful (because it isn't intended to be) .. why would it be wrong to call a birth parent, a real parent? I mean, I feel that both the birth/first parents and the adoptive parents are "real" parents. Am I wrong? @First Anonymous - I think asking how open a relationship is would be fine...if like you said, that you know them. I would definitely not ask a stranger. But be prepared...some people just aren't as open as others and they may not feel comfortable answering. I'm very honest and open (even with strangers...to a point) because I want people to see the REAL face of adoption, not what is sensationalized on TV & in movies. @Second Anonymous - Not disrespectful at all. :) I think the problem is that by calling birthparents the real parents you are (intentionally or not) implying that adoptive parents are not real (fake) parents. 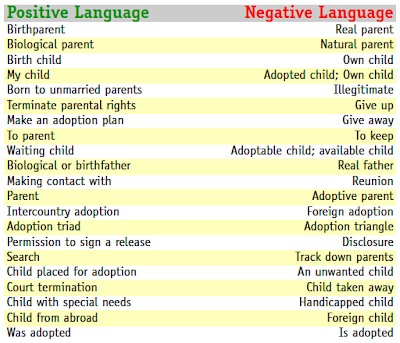 I think the reason it's always listed in tables like this as the negative to "birth parent" is that most times it is heard when strangers (or even friends or family...it's happened to us) say things like "What is his real mother like?" (calling birth parents real parents) It hurts like you wouldn't imagine to be loving this child, acting like a mother in EVERY aspect of the word...to only be called a fake-mother. I don't walk around calling myself his real mother...because that would also be offensive to his birthmomma. I'm simply his mom. And I do agree with you that both birth moms and adoptive moms are real. Their roles in the child's life are different, but both very important. I just hate when people use the term real...and most of the time I believe it isn't done to be spiteful, it's just ignorance. Thanks for posting this. 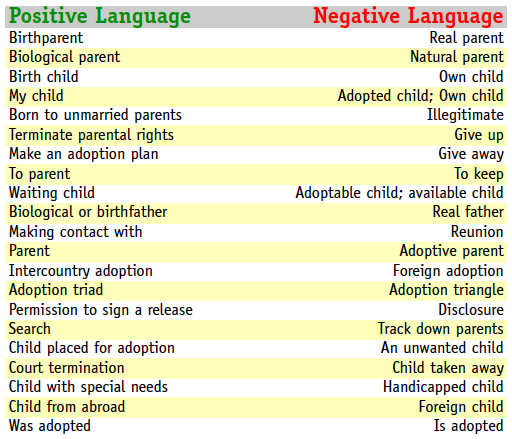 We learned about positive and negative language in our adoption training classes. I think most people don't mean any harm, they just don't think about the way things sound. Still, it's important to educate people, because our kids will be listening and we want to protect them from hurt.